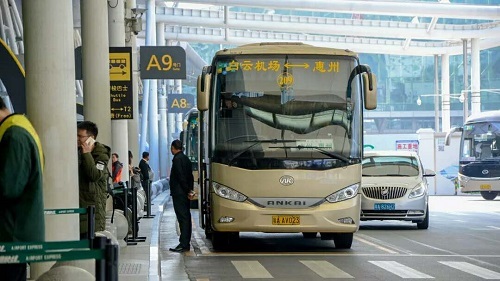 China Bus Guide is reported recently by a lot of users that it's hard for them to find the place to board the airport bus as Guangzhou Baiyun International Airport terminal T1 is now surrounded by curtain for re-construction. That's why we wrote this guide page. Both Arrival Areas A and B at Terminal 1 of Guangzhou Baiyun International Airport are now enclosed by curtain walls and bus pickup places have been changed a bit for this reason. Please read following information carefully to make sure you will not got lost. The current pick up places are located at A9 to A12 Gates, which you can see through following image. ☝ Pickup Place in Arrival Area A of Terminal 1 of Guangzhou Baiyun International Airport. Airport bus ticket counter is located at A5 and A10 Gates. 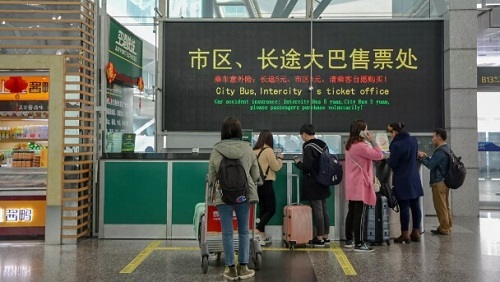 ☝ Ticket Counter in Arrival Area A of Guangzhou Baiyun Airport Terminal 1. 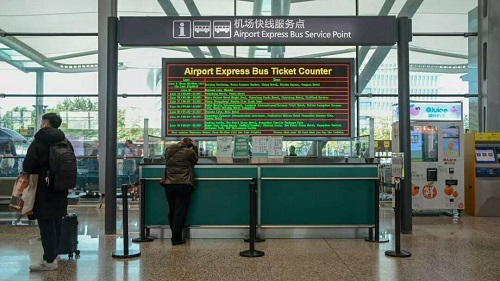 Here you can purchase onspot tickets on buses that run from the airport to Guangzhou downtown and neighbor cities. The current pick up places are located at B9 to B12 Gates, which you can see through following image. ☝ Pickup Place at Arrival Area B. Airport bus ticket counter is located at B5, B4 and B11 Gates. ☝ Ticket Counter at Arrival Area B selling onspot tickets to passengers. Those who want to reserve online tickets please send enquiries to [email protected] We will provide you e-tickets and you will be able to board the bus by scanning QR code on the e-ticket. ☝ Shuttle Bus. 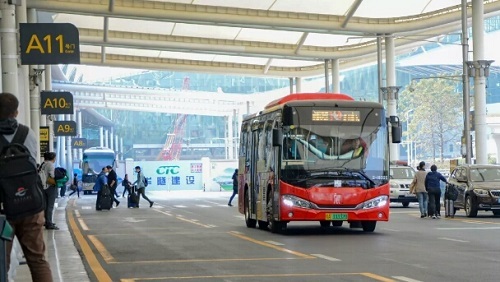 Guangzhou Baiyun Airport provides 24 hours a day free shuttle bus services to let passengers to travel between Terminal 1 and Terminal 2 efficiently. Guangzhou Baiyun International Airport Terminal 2 has just one arrival area, that is, the arrival hall on the ground floor. As long as you can follow the airport guide signs, you will have no problem to find the airport bus pickup place at Terminal 2. The airport bus ticket counter and bus pickup place are located to the right of the central passage inside the arrival hall. Some travelers may still can't understand where exactly the pickup place in terminal 2 is. Then please find it through the following layout map. 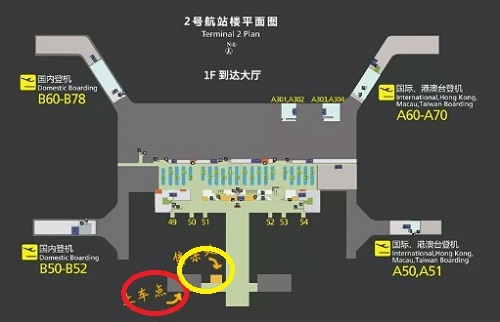 ☝ Layout Map of Guangzhou Baiyun Airport Terminal 2. The one circled in orange is for ticket counter and the one circled in red is bus pickup place. 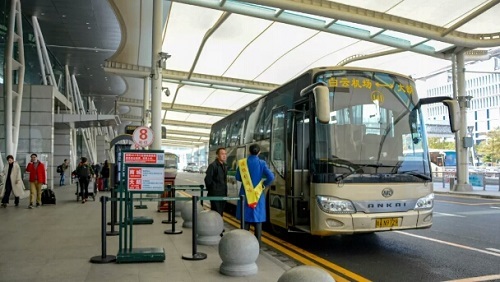 Have you ever traveled to Guangzhou Baiyun International Airport Bus Station? We encourage you to share your travel experience and review their service by leaving your comment here to help other visitors travel smartly. You can also leave a question here to get fast response.